The NeoCell Corporation is dedicated to providing premium collagen peptide-based dietary supplements for skin, connective tissue and joint health for consumers worldwide. All of NeoCell’s health, wellness and anti-aging products are doctor-formulated and offer the highest quality and precise combination of ingredients to maximize health and wellness benefits for consumers of all ages. NeoCell’s products are manufactured in their own GMP certified facility in California and guarantee the highest quality and safety manufacturing standards, meeting the needs of regulators world-wide. Refuel, Recover, Regenerate, Replenish - Collagen Sport™ is a muscle recovery sport drink containing whey protein, collagen, amino acids, vitamins, minerals and the antioxidant power of Pomegranate extract. 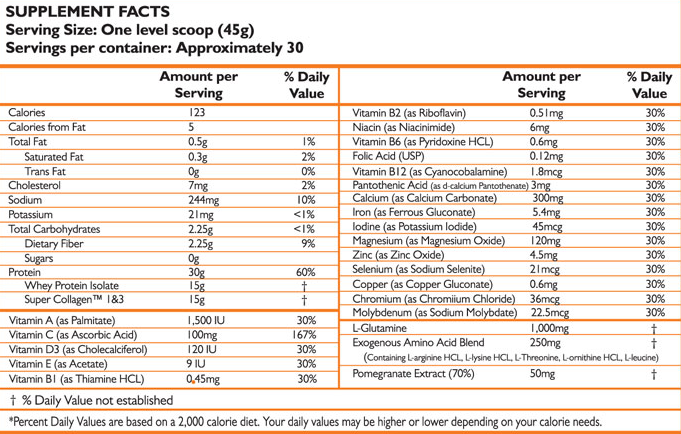 According to NeoCell Sport, whey protein Isolate is the preferred and superior form of protein for athletes. It’s rich in essential and branched chain amino acids (BCAAs), necessary especially after strenuous workouts. 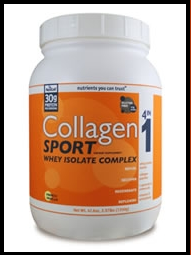 Kovas and I received some Collagen Sport to try out as a recovery drink, in both French Vanilla and Belgian Chocolate (check out what he thought over at Midwest Multisport Life). I love that it contains no sugar (and does not taste sweet) or artificial sweeteners, flavors, fillers, etc. and has a whopping 30 g of protein. Also with my history of two torn menisci, I am willing to do almost anything to help prevent further injury, and extra collagen sounds like a great addition to my prevention repertoire. Although the directions say mix with water or milk, I preferred it with soymilk - and (surprisingly) enjoyed both flavors equally - usually I choose chocolate:). For added thickness, blending with ice, yogurt and/or fruit is recommended. Winner will be chosen by random.org on Friday, January 13th. Good luck! More information can be found on the company website, liking Collagen-Sport on Facebook, and by following them on Twitter. 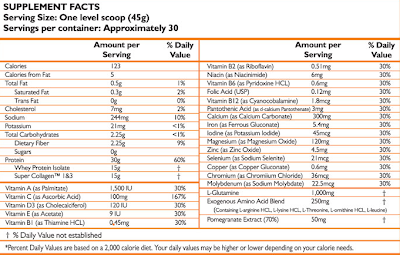 Can't believe how much protein is in ine scoop! I certainly do follow your blog. And I tweeted the giveaway. Linked your post to my blog sidebar. follower :) sounds like an interesting protein supplement. I'm not entering bc I've won so many of you guys' giveaways, but I would definitely be a fan of all the protein. Following Neo Cell on Twitter! I didn't know when they took that picture of me and all my friends at the gym they were going to use it for a NeoCell marketing campaign. If I had known, I would have flexed even more. I'm almost out of protein powder but must respectfully decline entry. My stomach does better with soy. 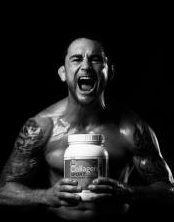 I liked Collagen Sport on your Facebook! I follow Neocell on twitter! I follow Collagen Sport on Facebook!! Works Cited - Paul, Steve. “Low Testosterone Fat Loss Bodybuilding - FDA Approved Brands!” Testosteroneofficial.Com Ie. Testosterone Official, https://testosteroneofficial.com/bodybuilding/. Accessed 20 oct. 2018. References - Velez, Valeria. 2018. “recetas para bajar de peso de 2018.” Adelgazaroficial.Com Ie. Adelgazar Oficial. Accessed November 23. https://adelgazaroficial.com/ .